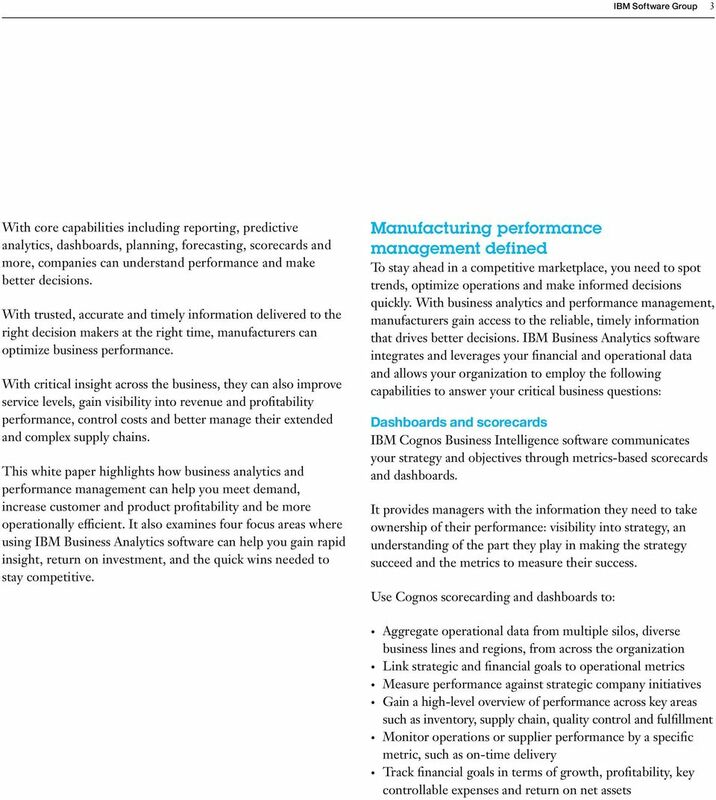 Download "Business analytics for manufacturing"
2 2 Business analytics for manufacturing Contents 2 Overview 3 Manufacturing performance management defined 6 Increasing operational efficiency 8 Improving maintenance and quality 9 Smarter supply chains 10 Reliable financial planning 11 Summary 11 Analytics in action Overview Whether the economy is strong or weak, the fundamental strategies for surviving and thriving still hold true. Manufacturers have to be highly efficient to meet demand and supply requirements. Costs and resources also have to be managed carefully and intelligently. At the same time, companies are considering new tactics: inventory optimization, maintenance operations, intelligent supply chains and leveraging technology as a focal point of business strategy. Staying ahead isn t easy. Data pours in from multiple systems, divisions and regions, and it is more real-time than ever before. IT departments are challenged to provide solutions that enable productivity and agility in the face of market and consumer demands. Manual processes, inefficiencies and lack of accountability add to the mix. Companies need IT investments that will help them re engineer decision-making processes so management can gain rapid insight into the business and people can make informed decisions. 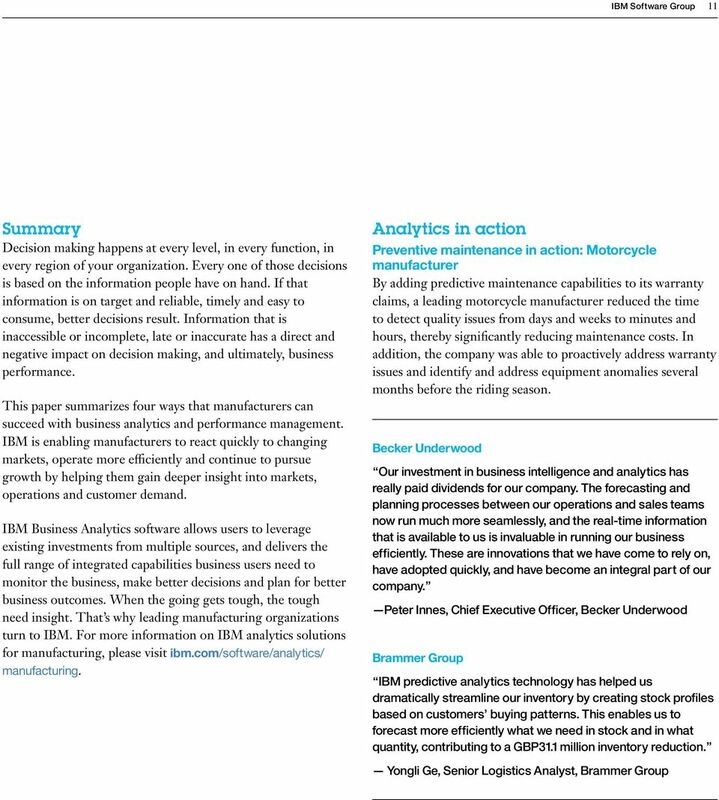 IBM Business Analytics software delivers complete, consistent and accurate information that decision makers trust to improve business performance. A comprehensive portfolio of business intelligence, advanced analytics, predictive analytics, financial performance and strategy management, and operational planning and forecasting gives manufacturers clear, immediate and actionable insights into current performance and the ability to predict future outcomes. 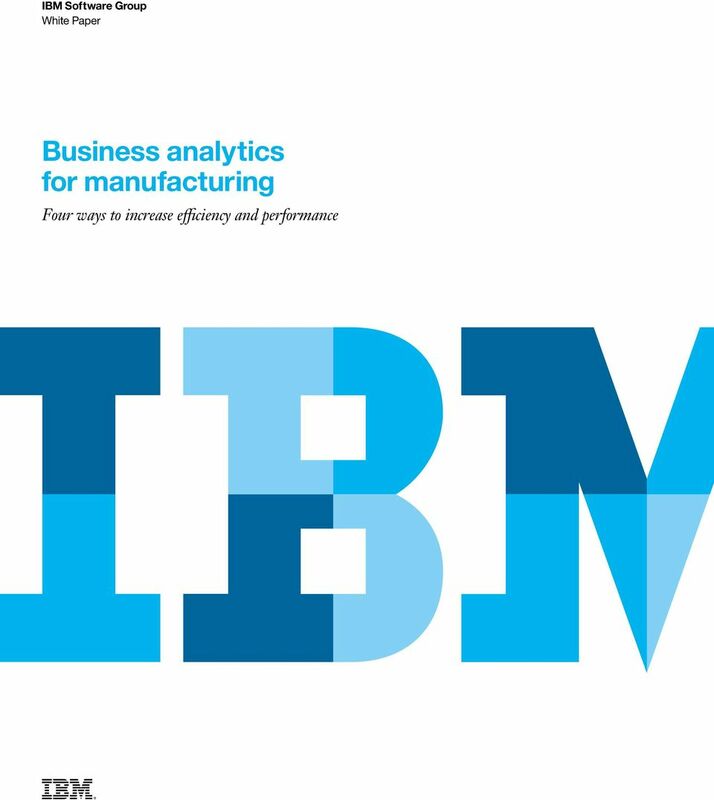 IBM Business Analytics offerings, including Cognos and SPSS software, allow manufacturers to leverage new intelligence to create sustainable and competitive advantages. 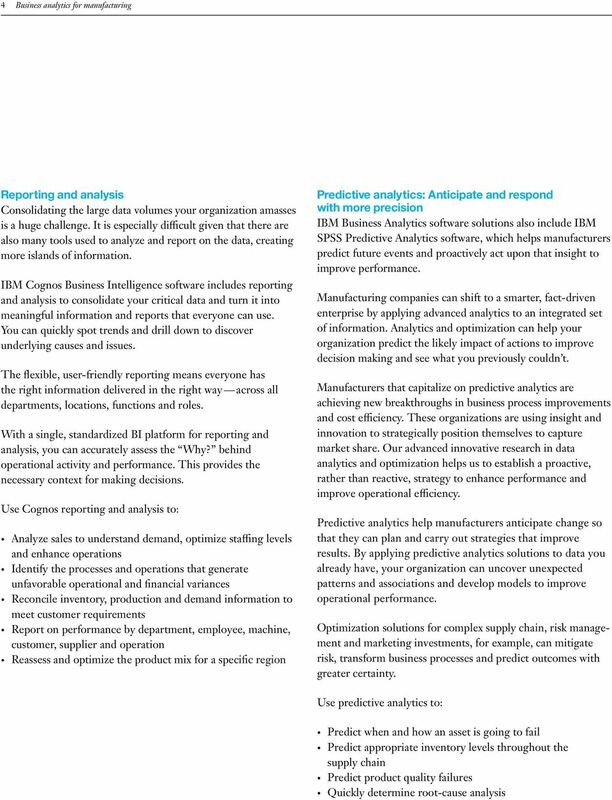 IBM business analytics and performance management solutions provide an enterprise planning, financial consolidation, business intelligence (BI) and modeling platform that helps companies plan, understand and manage financial and operational performance. In order to be successful your company needs access to critical information and visibility into how well your business, your market and your competitors are responding to today s challenging and changing times. 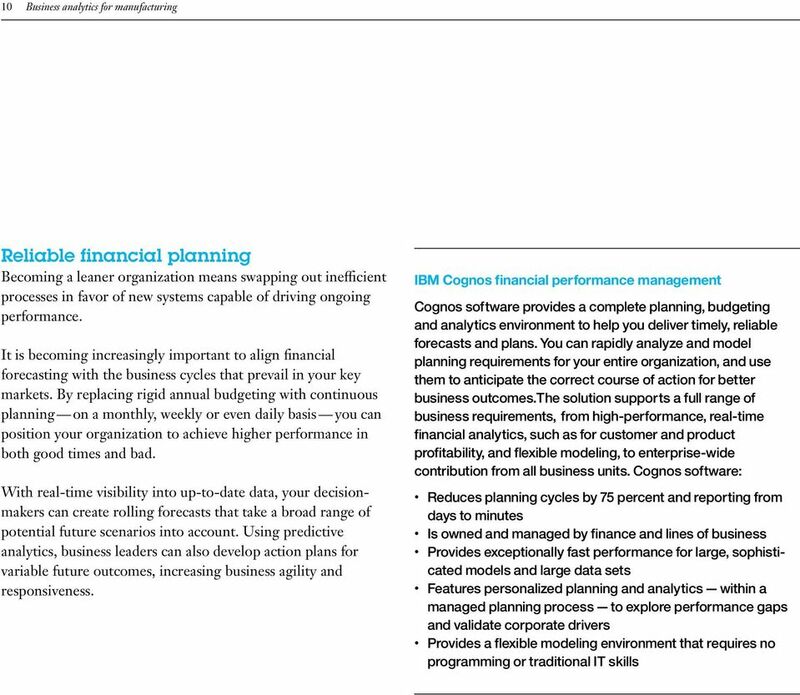 5 IBM Software Group 5 Budgeting and planning Many manufacturers still use spreadsheets for financial planning and budgeting. Spreadsheet-based systems create islands of data, where everyone works independently. A more effective solution is one that replaces a fragmented process with continuous, collaborative planning that supports your business drivers and delivers up-to-date insight into performance. Cognos software helps you to address the question What should we be doing? by allowing you to set strategic initiatives and turn them into discrete plans and budgets for the entire enterprise from central office to plants, and marketing to distribution centers. 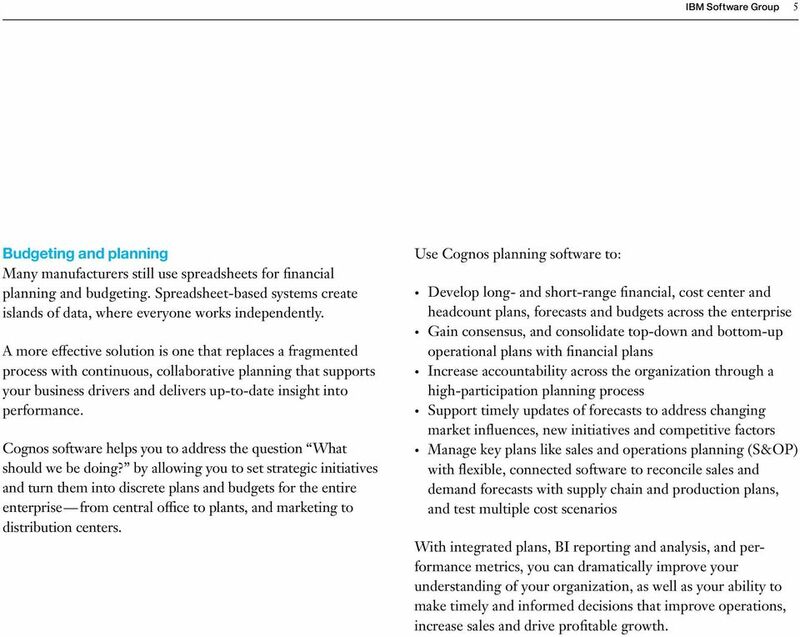 Use Cognos planning software to: Develop long- and short-range financial, cost center and headcount plans, forecasts and budgets across the enterprise Gain consensus, and consolidate top-down and bottom-up operational plans with financial plans Increase accountability across the organization through a high-participation planning process Support timely updates of forecasts to address changing market influences, new initiatives and competitive factors Manage key plans like sales and operations planning (S&OP) with flexible, connected software to reconcile sales and demand forecasts with supply chain and production plans, and test multiple cost scenarios With integrated plans, BI reporting and analysis, and performance metrics, you can dramatically improve your understanding of your organization, as well as your ability to make timely and informed decisions that improve operations, increase sales and drive profitable growth. 8 8 Business analytics for manufacturing Improving maintenance and quality According to a recent Aberdeen Asset Management report, when executives were asked about which risks had the biggest impact on operations, the #1 item stated was failure of critical assets. 1 Fundamentally, organizations lack not only visibility, but also predictability, into their assets health and performance. Maximizing asset productivity and ensuring that the associated processes are as efficient as possible are key aspects for organizations striving to gain those strong financial returns. Capital equipment utilized in production facilities is subject to high costs and unplanned downtime. While companies have a great deal of data on maintenance history and cost, as well as utilization data, it is difficult to accurately predict the combination of operating characteristics that lead to failure. Predictive maintenance is key. Predictive maintenance is different than preventative maintenance or condition monitoring, because predictive maintenance takes into consideration usage, wear and environmental factors of the asset to predict its failure. The insights regarding when assets will fail and why are key inputs into quality, S&OP, spare parts inventory, and financial planning processes. 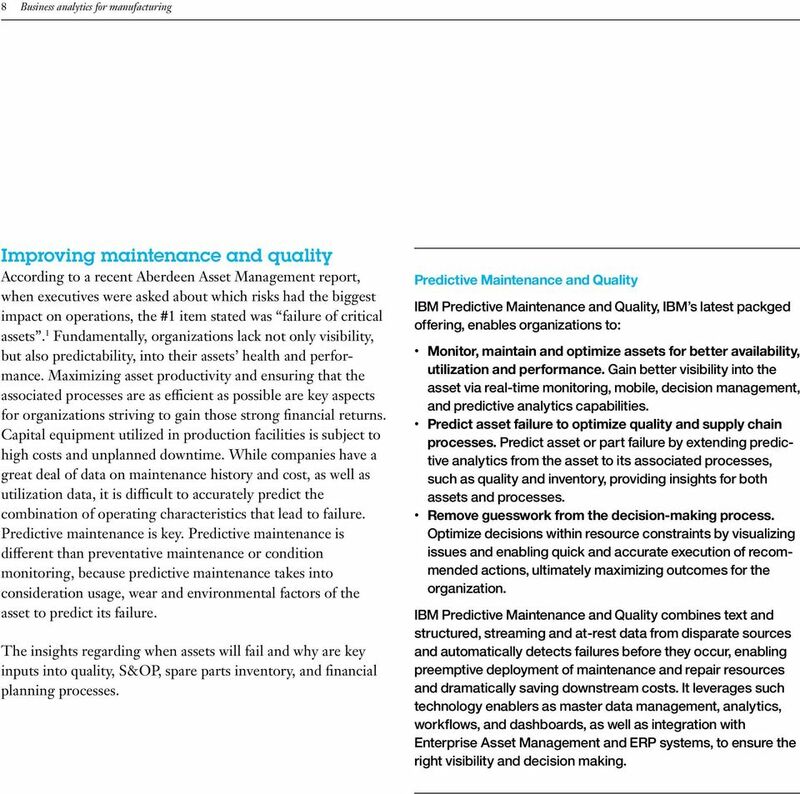 Predictive Maintenance and Quality IBM Predictive Maintenance and Quality, IBM s latest packged offering, enables organizations to: Monitor, maintain and optimize assets for better availability, utilization and performance. Gain better visibility into the asset via real-time monitoring, mobile, decision management, and predictive analytics capabilities. Predict asset failure to optimize quality and supply chain processes. Predict asset or part failure by extending predictive analytics from the asset to its associated processes, such as quality and inventory, providing insights for both assets and processes. Remove guesswork from the decision-making process. Optimize decisions within resource constraints by visualizing issues and enabling quick and accurate execution of recommended actions, ultimately maximizing outcomes for the organization. IBM Predictive Maintenance and Quality combines text and structured, streaming and at-rest data from disparate sources and automatically detects failures before they occur, enabling preemptive deployment of maintenance and repair resources and dramatically saving downstream costs. It leverages such technology enablers as master data management, analytics, workflows, and dashboards, as well as integration with Enterprise Asset Management and ERP systems, to ensure the right visibility and decision making. 9 IBM Software Group 9 Smarter supply chains Global supply chains hold big potential for production, cost management and efficiencies. Orchestrating the chain, however, requires more than just mastering logistics. 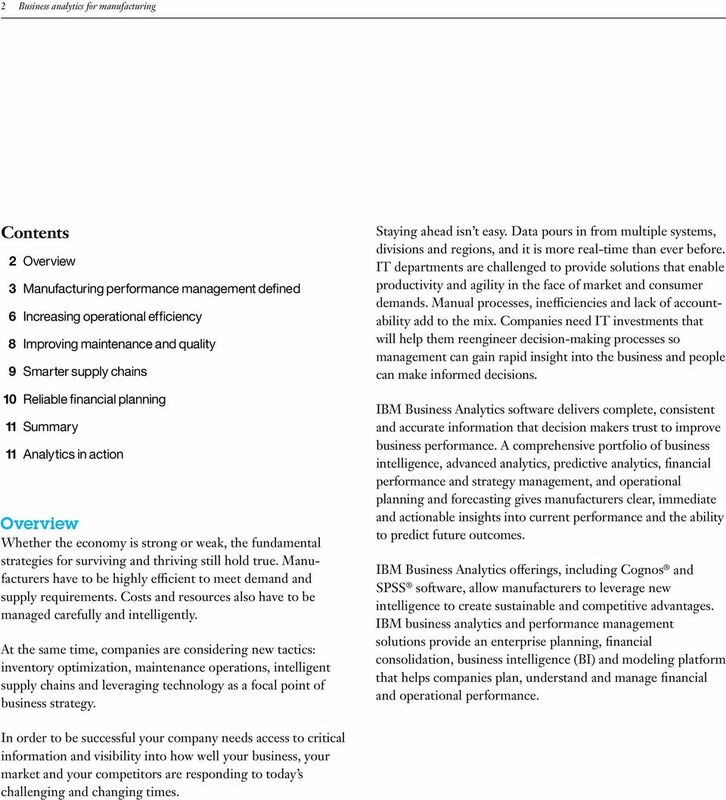 A recent executive report by the IBM Institute for Business Value New Rules For a New Decade points to new rules to optimize supply chain performance: 1. Know the customer as well as yourself. Smooth volatility with predictive demand. 2. See what others do not. Unveil visibility with collaborative insight. 3. 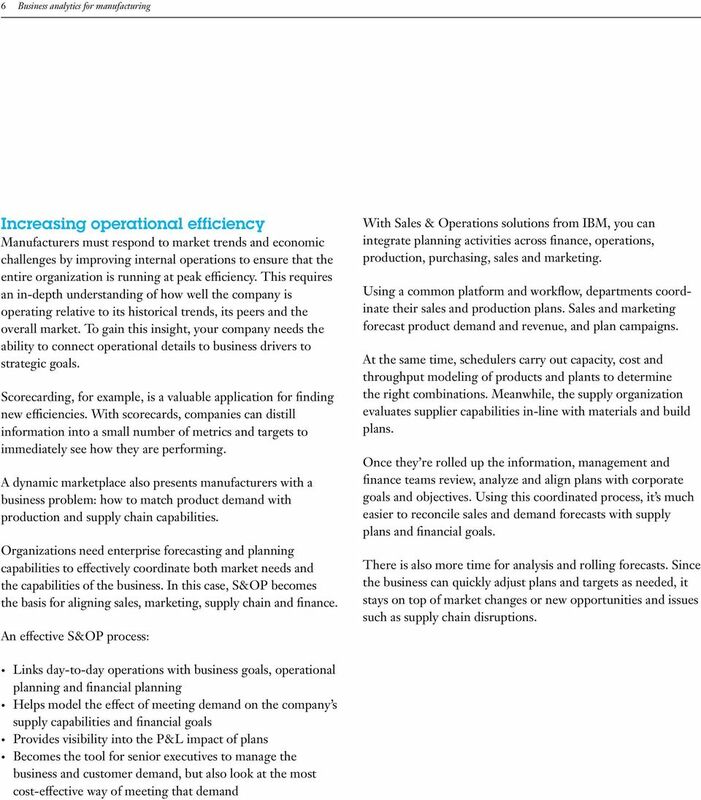 Exploit global efficiencies, and enhance value with dynamic optimization. Visibility Performance management and business analytics provide organizations with complete visibility into and across their supply chains. It brings together data residing in different systems and at multiple levels of granularity. Managers can monitor performance at the global level, analyze performance across processes, products or suppliers and dive down to transaction-level detail. They can identify key metrics, measure performance and receive alerts when performance is off track, allowing them to make immediate corrections. Predictability With Cognos Business Intelligence and SPSS software, future results become more predictable. Through regular reporting and analysis, managers can identify events, trends or other conditions that lead to problems. This helps them become proactive and eliminate problems before they occur. Complete and connected information IBM Cognos BI and TM1 provides managers, partners, suppliers and customers with the complete and consistent information they need to produce meaningful and actionable analysis. Reports, analysis and other information can be distributed through a centralized portal or extranet. Effects of decisions can be evaluated so people understand the cost-to-serve and make better decisions. Complete, connected information enables better collaboration. If a flaw or delay is identified, managers, suppliers, partners and customers can be alerted, allowing them to work out a collaborative solution. Supply chain analytics Benchmarking allows you to compare the metrics of a process or method against an industry standard or best practices from other companies. 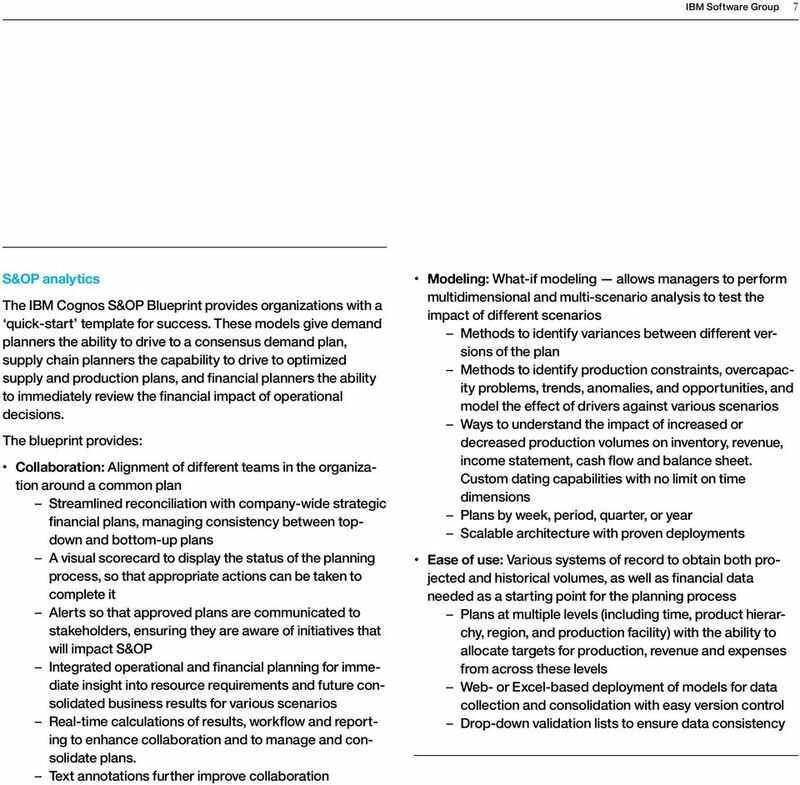 Cognos scorecards support the Supply-Chain Operations Reference (SCOR) model developed by the Supply Chain Council. The SCOR model provides a framework that links processes, metrics, best practices and technology to improve supply chain management. 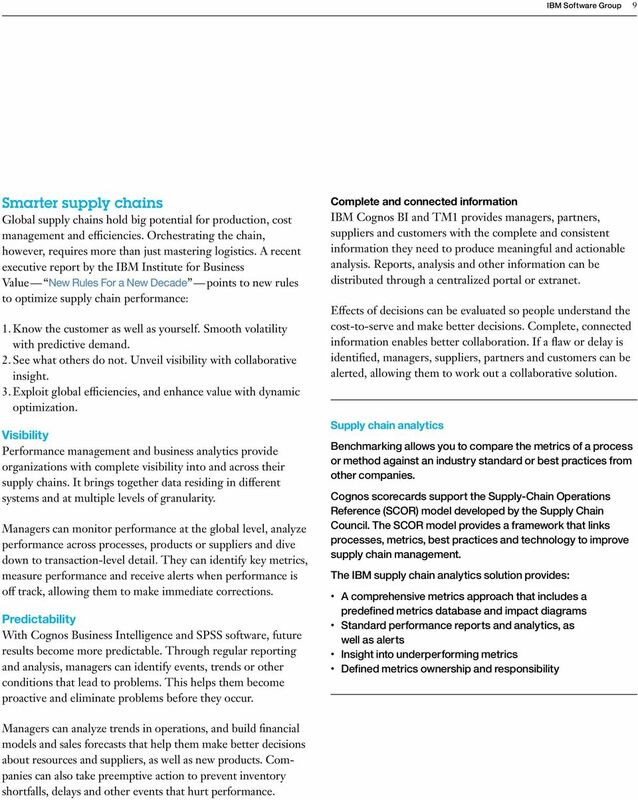 The IBM supply chain analytics solution provides: A comprehensive metrics approach that includes a predefined metrics database and impact diagrams Standard performance reports and analytics, as well as alerts Insight into underperforming metrics Defined metrics ownership and responsibility Managers can analyze trends in operations, and build financial models and sales forecasts that help them make better decisions about resources and suppliers, as well as new products. Companies can also take preemptive action to prevent inventory shortfalls, delays and other events that hurt performance.